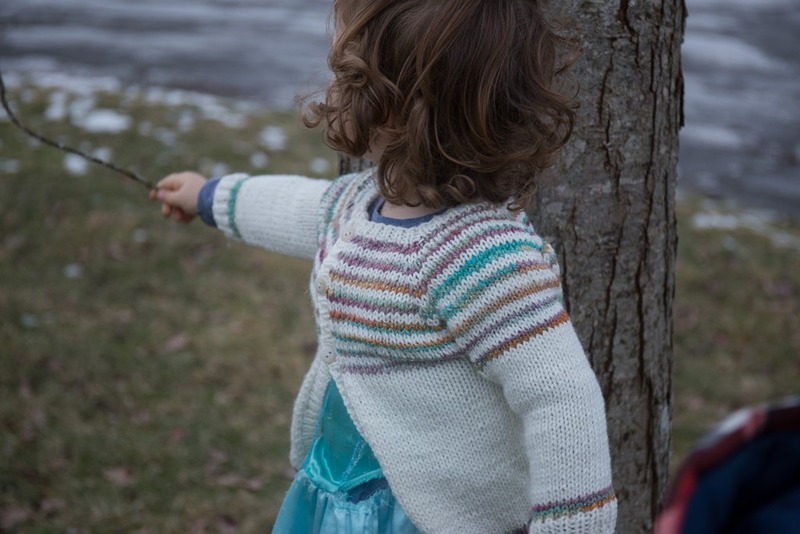 Recently, Norah asked for some new sweaters to add to her ‘collection’ – she has a drawer full of hand knit sweaters from when James was a baby and I knit quite a few then for both kids to wear. Sadly, they are now too small but she continues to want them in her dresser drawer. After heading to the yarn shop recently, which I chatted about last week, I decided to finish off the first sweater that I had been wanting to start since before Christmas. It also officially became the first finished object from start-to-finish of 2017! 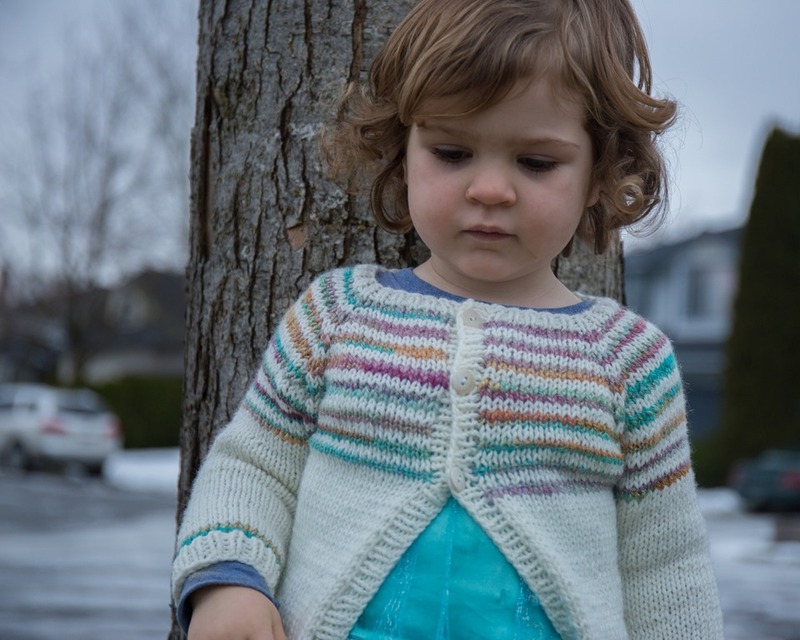 The handspun in this sweater is from my stash – I used some of it for the toque I knit for my niece for Christmas but I still had enough to knit the stripes in the cardigan for Norah. I may actually have enough for a toque for her as well. The white is Berroco Vintage in colour Mochi. It’s a nice white – not too white but not cream. It works perfectly with the handspun I paired it with. Norah is wearing two layers under this cardigan so it looks tight but it’s actually about 2” of positive ease on her. I know the 2-4 years size from the Flax pattern. In the end, I didn’t use the picot edging that I had planned. It just didn’t suit Norah once it was on her. Instead, I ripped it out and knit 6 rows of 1×1 rib on the hem and sleeves. Originally, I had planned on using really cute buttons but I settled on simple cream and white ones instead. I wanted nothing to take away from the sparkle of the handspun. In the end, it’s very effective! I also attached a little Hand Made bead to the bottom that she thought was amazing. I’m tempted to put this on many of my items from now on since I have about 50 of them! Knitting for Norah has been a highlight of the beginning of the year and I’m looking forward to knitting some more sweaters for her before the end of the year. Do you make for your little ones? What are your favourite things to make for them? So beautiful! And the handmade bead is so clever and such a perfect touch! Over the years we’ve gotten a lot of play out of the Ruched Yoke Tee, the Raspberry Lemonade top, Swish Pleated Skirt, and finally the most use of all out of Emma’s Unmentionables. Now she’s old enough she doesn’t want hand knits, not even scarves. But, those were some glorious knitting years in my life! 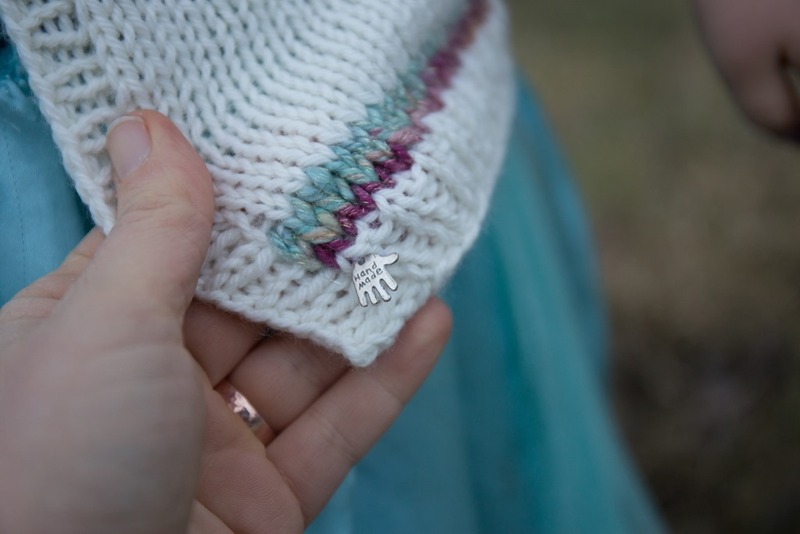 I love to knit for my daughter — she’s very knitworthy! I’ve knit her quite a few sweaters as well as hats and mittens. She keeps asking for socks, but I’m waiting until her feet stop growing so quickly. It’s funny because James doesn’t like sweaters either – too hot! But yes, blankets and I have to say, he loves his mittens and toques! 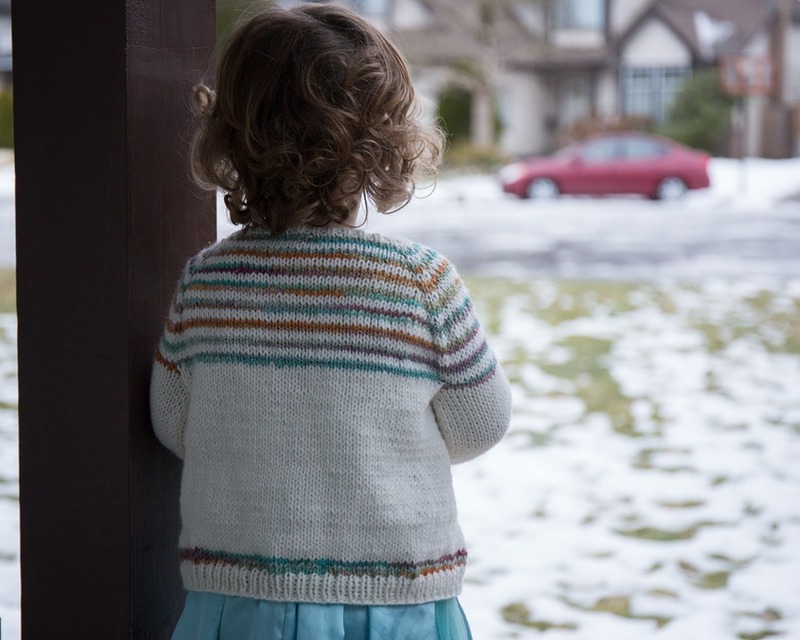 Tincanknits has great kids patterns – I’ve made gramps several times, and Antler. taiga Hilliard designs beautiful children’s dresses, some with simple lace, some with texture & I believe all without seams. And tikki knits has a sweater called http://www.ravelry.com/patterns/library/grannys-favourite that would be perfect for handspun, since it’s designed to get the most out of a fixed weight of yarn. It’s also seamless. 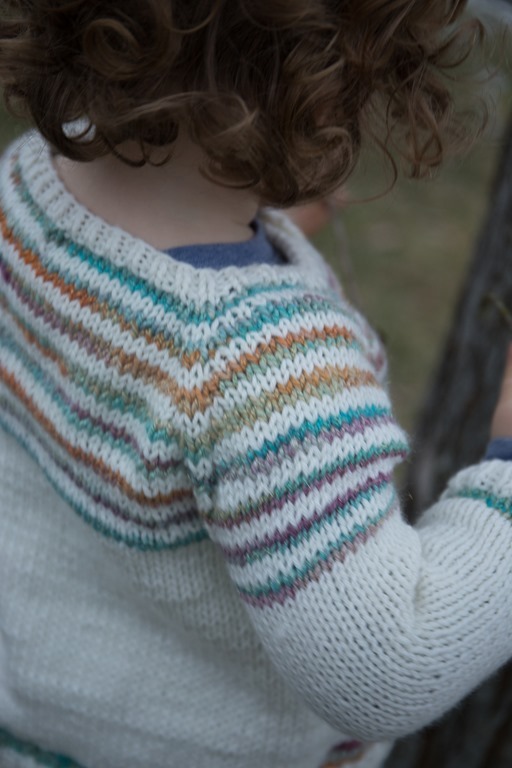 I don’t mind seaming kids knits, since they’re so small, but it does go faster without that extra step. Vests like Milo or Pebble. Great for keeping the chest warm without getting in the way of action (or being too hot).